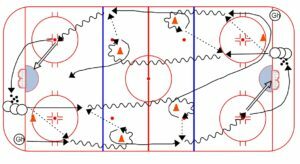 This power turn and passing drill is a great one for younger to intermediate age groups. Use this drill to work on power turns, passing, and certain timing and support concepts with your youngsters. When done well, it’s a quick-paced drill that works on some of the key fundamentals that are important in the game of hockey.